In a previous post I had explained how the Spaniards ended up with a mother lode of wealth when they conquered the Americas. 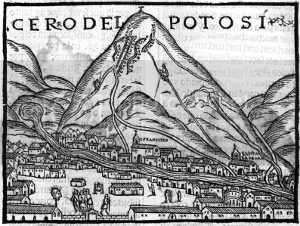 They were able to mine silver from places like Potosi from where silver was extracted and sent back to Spain. Between 1560 and 1685 CE, Spanish America sent between 25,000 to 35, 000 tons of silver to Spain and in the century following that the amount doubled causing an inflation in Europe. But if you analyze the English coins during that period, you see traces of Mexican silver, but not Potosi silver. Today there is an explanation.